Here is another good news for the jobinassam reader. 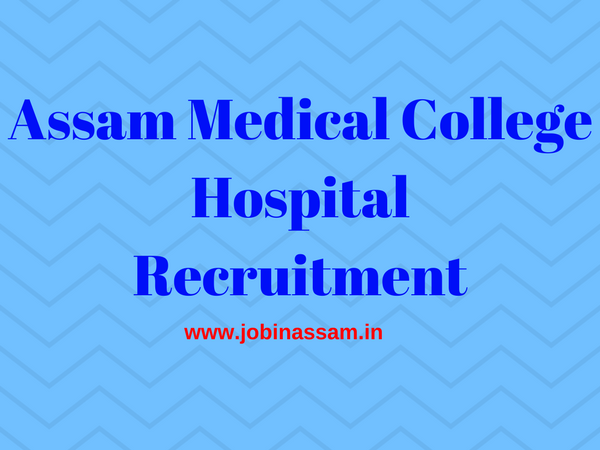 jobinassam brings Assam Medical College Hospital, Dibrugarh Recruitment news for you. 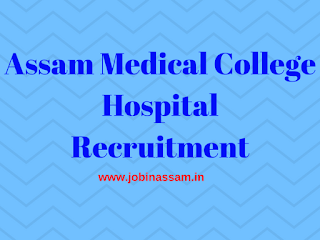 Assam Medical College Hospital, Dibrugarh invites application for the various vacancies described below. Online applications are invited for the following posts as shown below under the establishment of the Superintendent, Assam Medical College Hospital, Dibrugarh which will be available at the official website of Directorate of Medical Education, Assam (www.dmeassam.gov.in). Educational qualification: H.S. (science) with laboratory technician diploma holder. Educational qualification: H.S. (science) with Radiographer technician diploma holder. Educational qualification: H.S. (science) with Radiation therapy technology diploma holder. Educational qualification: H.S. (science) with multi Rehabilitation/MR technician diploma holder. Educational qualification: H.S. (science) with 1-year experience in dark room related X-ray. Educational qualification: H.S. (science) with Pharmacist diploma holder. The following documents in original will have to be produced at the time of document verification and photocopies of all certificates etc. are to be submitted. 2 (two) copies of recent passport size color photograph duly self-attested. HSLC admit card or birth certificate for age proof. All mark sheets and pass certificate. The application fee of Rs. 250/- (Rupees two hundred fifty) only for General Category Candidates and Rs. 150/- (Rupees one hundred fifty) only for OBC/ MOBC, SC, ST(P) & ST(H) category candidates which will have to be paid through net banking/ credit card/ debit card while submitting the online application form. No fee is required for BPL candidate and they are required to upload their BPL certificate from the competent authority for such exemption of fee along with the application.